The real Rub ‘Al Khali is empty, but the deserts of Azraq, Jordan are not. In fact, T. E. Lawrence spent time at Qasr al-Azraq chronicling his travels. 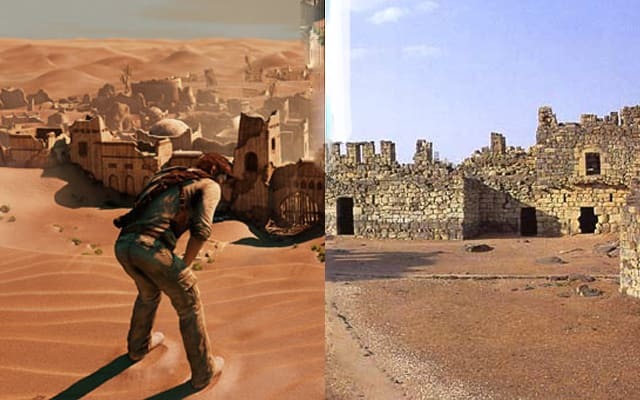 Uncharted 3 seems to have an appreciation for that literature, and likely drew some inspiration for the settlement in the Rub ‘Al Khali from this ruined castle. Both presumably arose from nearby oases and thrived on their tactical location along trade routes, and later fell into vacancy and disuse because the inhabitants realized they were living in a damn desert.